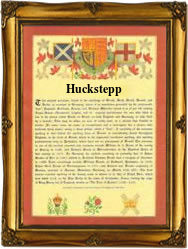 Recorded in a number of forms including Hucstep, Huckstepp and Huxstep, this is an English surname. It is almost certainly locational, and if so originates from a now 'lost' medieval village which was probably in the West Country. Surnames from 'lost' villages are a significant feature of the surnames list, and research suggests that as many as five thousand British and Irish surnames derive from this source. Villages ceased to exist for several reasons including plague and occasionally war, but the usual reason is a change in farming policy, particularly the introduction of sheep farming from the 14th century onwards, for the growing textile industry. When this happened, tenants were often driven off their lands and forced to seek homes and employment elsewhere. These people then took or were given, as their surnames, the name of their former home. Spelling being at best erratic, lead to the development of 'sounds like' spellings. In this case we believe the development is from the Olde English pre 7th century tribal name 'Hucca' plus 'stoep', meaning a hollow or valley. Examples of the surname recording include: Elizabeth Huxstep who married John Covell at the church of St Lawrence Jewry in the old city of London, on October 26th 1774, and Mary Huckstepp, who married Abraham Hall at St Martins in the Field, Westminster, on October 3rd 1798.